Kokone is about to enter her final year of High School but she has a habit of falling asleep while she should be studying. While asleep she dreams of a magical (but relatively technologically advanced) kingdom called Heartland- a world where princesses and sorcery rub shoulders with cars and giant robots. But when her father is suddenly taken away, boundaries between what is going on in the real world and the dream world began to blur. 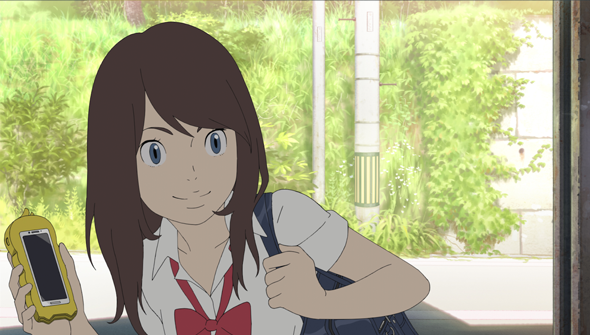 Napping Princess (also known as Ancien And The Magic Tablet) is written and directed by Kenji Kamiyama, who is best known for working on series such as Ghost In The Shell: Stand Alone Complex and Eden Of The East. A family fantasy film is uncharted territory for a figure more familiar with producing more hard sci-fi, thrillers or other, more mature fare. So how does he get on? Pretty darn well, we're pleased to report. The film blends an everyday slice-of-life feel with the more fantastical elements and somehow manages to do so in a way that doesn't feel jarring. Kokone's everyday small-town life is portrayed with loving detail, all sun-dappled summer days and bright blue skies. Similarly, the dreamworld is brought to life skillfully, creating an original spin on the fairytale kingdom that is perhaps inspired by Japan at its height of its pre-recession economic miracle. The relationship between reality and the dreamworld is a little fuzzy, and this will frustrate some audiences. Is Heartland real and connected to reality or is it just part of Kokone's dream? It's not really a spoiler to say that it never really answers this question, and Kamiyama leaves it open to interpretation. In the end though, it doesn't really matter as the heart of the film is really primarily interested in a story of family, and the relationship between Kekone and her father (and later, her grandfather). The near-future setting (with events taking place in the run up to the Tokyo 2020 Olympics) puts a fun extra twist on things, too. It's not quite a home-run, with several niggling issues that prevent it from making the jump from good to truly great. Kokone is an endearing central character but her characterisation is drawn with the broadest of strokes. And beyond Kokone and her father characters are mostly two-dimensional, with the villain Watanabe, and Kokone's closest male schoolfriend getting particularly short shrift. The film takes its time to get anywhere and has a pace that some may describe as relaxed, but others may not be quite so kind. Honestly, though it could perhaps have done being around 10-15 minutes shorter. Nobody could argue however that the film is anything less than a success in the visual department, as Napping Princess looks beautiful throughout. Deceptively simple character designs blend with some stunning backgrounds to produce a movie that can hold its own against some of its higher profile brethren. Those who are familiar with Kamiyama's past work will be unsurprised that this also features some expertly integrated 3D CG, that blends seamlessly with the traditional animation. 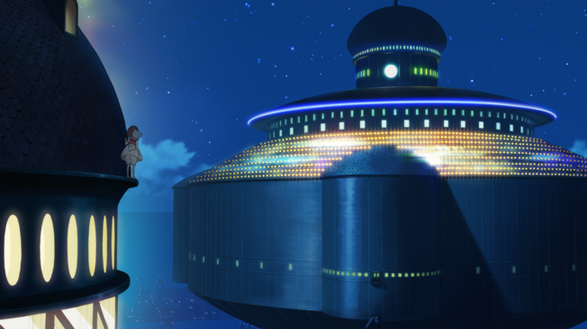 That is except for in one solo sequence, where the attempt to create a sense of Miyazaki-style wonder with a flying sequence is entirely fluffed with some iffy computer backgrounds. There are some great mechanical designs here though- thanks to the presence of Shigeto Koyama, who also designed Baymax in Disney's Big Hero 6. Any complaints here are pretty minor in the big scheme of things, as overall Napping Princess is a highly enjoyable watch. Gorgeous to look at and full of heart, it's a thoroughly charming family yarn that deserves to find a wider audience. 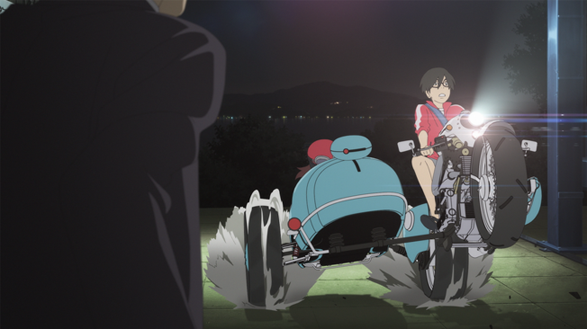 As Kamiyama's family feature debut it may not be challenging Ghibli just yet.. but its a promising place to start. IN A NUTSHELL: An unexpected gem of a film with fantastic visuals and a distinctive voice. *Screener provided by GKIDS Films. Original language version reviewed.